After our first two days of rain and grey skies, the third morning dawned bright but cool, with the promise of sunshine all day. We decided to try the coastal footpath walk around the headland to Karathona Beach. But first, breakfast on the terrace! 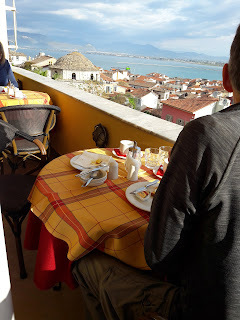 We started the walk at the harbourside in Nafplio where it was still a little chilly. We stopped off at the bakery to buy filled baguettes for our picnic lunch and also bought a bottle of water to take along. The first part of the footpath is stone paved and leads to the nearby beach of Arvanitia, with some great views back towards the bay. From Arvanitia Beach the path becomes gravel and winds around the base of the cliffs. We were quite amused by this sign at the beginning of that section of the footpath - we think it must have been put up following recent landslides and just left there. After our first day's showers, the second morning broke grey and dull with the threat of more rain to come. 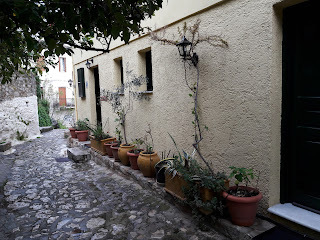 As our little pension was tucked up beneath the Acronafplia castle, we decided to take a walk up there as we had read that it was worth a visit. This stone archway marks the start of the path that winds up through the castle grounds. It bears the winged lion symbol of St Mark above the lintel, from the time of the Venetians in Nafplio. 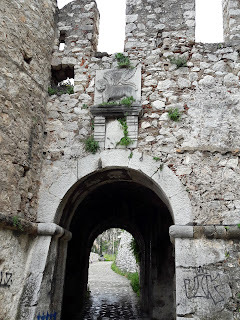 The castle is the oldest part of the town, and at one time actually housed the entire town within its walls, until it was turned into a fortress by the Venetians in the 13th century. Our first day in Nafplio was forecast to be cool and showery so we decided to just spend the day wandering around and familiarising ourselves with the town. The entrance to our rooms. When it started to rain, we popped into the Military Museum as P has always had a keen interest in military history. It is housed in a quite beautiful building from the 1800s which was originally the army cadet school. The current army cadets still man the ticket office and guard the museum and they are wonderfully polite and friendly young men. The collection was small but had some interesting information about the various conflicts from the Greek rebellion against the Ottomans through the Macedonian and Balkan wars and the WW2 occupation and liberation.